I do most of my supermarket shopping online these days, but the trouble with that, is I often miss out on new products arriving in store. So when I venture away from my virtual shop into the real thing, I usually find all sorts of products I’d never have known about. On my latest trip to a Waitrose store, I spotted a few new products from Weight Watchers, one of which are these individual fruit puree pouches. There were two varieties: Berry Crush and Tropical Crush. I purchased one of each. 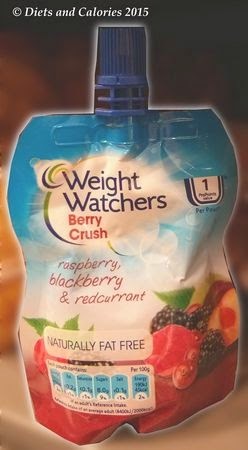 The Tropical Crush has 42 calories while the Berry Crush has 41 calories. Both are worth 1 ProPoint. I was happy to find that this product from Weight Watchers contains 100% pure fruit with no weird sounding ingredients. The Tropical Crush puree contains pineapple, apple, pineapple, apricot and mango while the Berry Crush has a combination of apple, plum, raspberry, blackberry and redcurrant. The plastic pouch has a screw top opening which can be closed again. This is useful if you don't want to eat it all at once, or you need a quick ‘sweet hit’ and can’t find any fruit while you’re out. Although there aren't any serving suggestions on the pack, I’d recommend using these fruit purees for adding to yogurt rather than buying yogurts with added fruit, as they usually have way too much sugar. I enjoyed eating these fruit purees in three different ways: squeezed straight from the pouch; mixed in with natural yogurt; and made into a chia pudding with coconut milk. They're delicious, easy to eat and children really like them too (well mine did)! 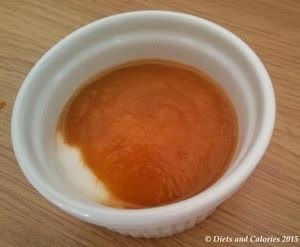 They're not overly sweet and taste exactly what they are - pureed fruit with nothing added. Suitable for vegetarians. Each pouch contributes to one portion of fruit. Cost £0.85 per 90g pouch in Waitrose. 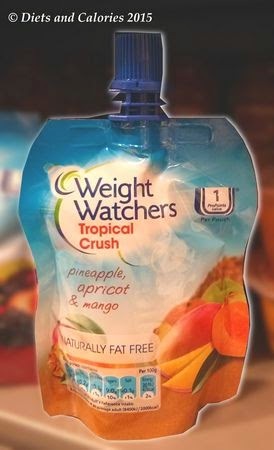 Nutrition Information per 90g pouch (Tropical Crush): 42 calories, 0.6g protein, less than 0.2g fat, less than 0.1g saturates, 9.3g carbohydrate, 9.0g sugars, 1.5g fibre, less than 0.1g salt. Ingredients: Apple Puree (36%), Pineapple Puree (30%), Apricot Puree (26%), Mango Puree (7.5%).